GRAND TRAVERSE COUNTY, Mi. (WPBN/WGTU) — Crews from Coast Guard Air Station Traverse City headed south Thursday night, after getting word that their help is needed following the devastation brought on by Hurricane Matthew. Right now, one helicopter and four crew members from Traverse City are on the way but more crew members could still be sent down. It's unclear right now where exactly the team will be stationed. 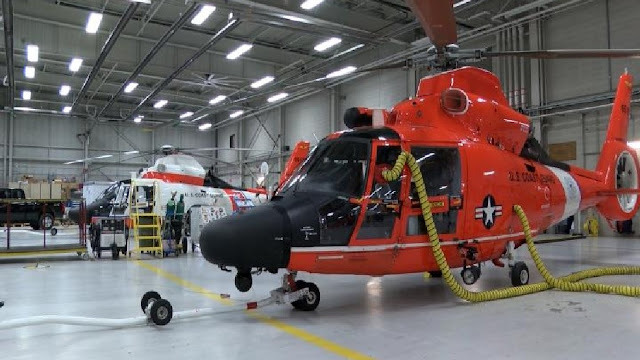 Coast Guard Air Station Traverse City says they'll know more in the next day or two where they are needed most. Commander Rob Donnell said earlier Thursday that the men and women assigned could be sent anywhere along the east coast, the hardest hit areas in Florida, or as far as Haiti. Before the call came in, crew members were waiting at home on standby. "If they're not home working, they're not under any crew mission limitations or flight limitations," said CDR Donnell. "So we've got our crews on a four hour standby in the event that a call does come in. We need to be able to get them as close to the affected area as we can." Crew members could be sent to help with things like rescue operations and coastal patrols, according to CDR Donnell.